The updated eCommerce Widget now supports in-app purchases from Apple iTunes and Intuit Merchant Services. Businesses can use quickbooks payments with online login. Foster City, CA -- Selling in-app purchases within a mobile app built using BuildApp just got a whole lot easier thanks to the launch of a new updated eCommerce widget with Intuit Merchant Services. The tool allows iBuildApp customers to easily add eCommerce to mobile apps so customers can click through and buy downloadable products from Apple iTunes. Small businesses can use QuickBooks Payments for payment processing to get paid fast. They can accept credit cards, e-checks and ACH transfers from banks at low rates. 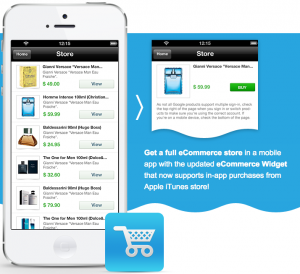 The eCommerce widget allows businesses to offer their customers a completely new shopping experience on mobile. The free and no coding required solution from iBuildApp sets a new standard for easy implementation of mobile shopping. The widget is integrated with iTunes in-app purchases iTunes, Paypal for Android. These payment integrations allow companies to set up their mobile store in minutes. Businesses can accept now payments in by using Intuit Merchant service. You can use login to QuickBooks Online account to access this best cloud accounting and bookkeeping software for small businesses. “Our new product will save business owners tens of thousands of dollars that would otherwise be used to develop storefronts specifically tailored to meet the requirements of their company. With our updated eCommerce widget, iBuildApp now has a powerful ready-to-market solution that caters to SMB and e-commerce stores,” said Rafael Soultanov, CEO of iBuildApp. Android and iPhone apps are becoming increasingly popular for small businesses to sell their goods to millions of consumers who use smartphones. According to eMarketer data, the mobile commerce revenue in USA is projected to grow by 55% in 2017. By 2017, Forrester make a prediction that the US mobile market payment market will grow to $90billion. Small businesses can use online QuickBooks Pro login to create invoices and track expenses for free if use online. It support iPad, mobile phone or computer to do invoicing, billing, run reports, or even pay employees online. By using quickbooks with online login businesses can track, record expenses for tax time or photograph and save receipts with your phone. Email invoices and accept online and mobile payments. Smartphone shoppers also spend more. According to Mobile Commerce Daily, smartphone shoppers are expected to spend 72 per cent more than non-smartphone shoppers. iBuildApp customers can tap into this growing market now by accepting credit cards on mobile apps with Intuit Merchant Services. With iBuildApp, mobile apps to be created and deployed to all major mobile operating systems with a few clicks, and will adhere to the strict apple iTunes review team standards required to be published on Apple App store. With Intuit accounting software small businesses you can perform billing and invoicing to control business accounts. 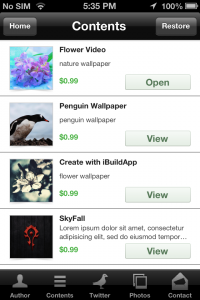 The updated widget was a result of customer requests, including this question: How can I create in-app purchases with iBuildApp.com ? Using the iBuildApp platform, anyone can build, test, and publish a mobile app quickly and inexpensively, without knowing any code. And now, anyone can turn their app into a valuable marketing and branding tool, by letting customers buy directly within an app. iBuildApp is a patent-pending automated mobile app creation and publishing Platform-as-a-Service. The platform allows any business, group or individual to create and publish a native or a web app for a smartphone or a tablet (currently supporting HTML, iOS and Android) in a matter of minutes. The interface is template-based with widgets to add location (maps), contact us, coupons, video, audio, pictures, RSS, Twitter, Facebook and more. 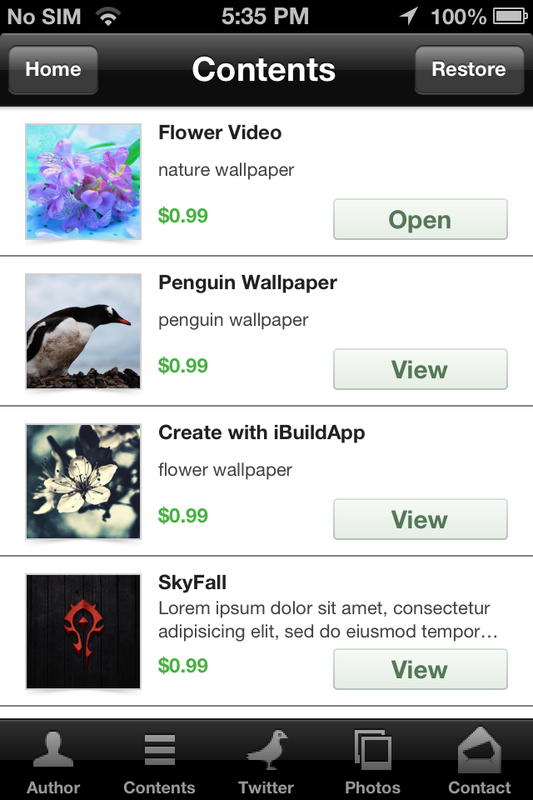 iBuidApp is a mobile DYI platform for iPhone, iPad, Android and HTML5 apps. Since launching in 2011, there have been over 16 million downloads by over 260,000 businesses (app builders). There are been over 320,000 apps built and over 60,000 apps published and monthly visitors exceed 2.5 million. Businesses can take advantages to accepting credit and debit card payments with Intuit Merchant Services. You can give your customers the convenience of paying by mobile phone, by tablet or online. In order to start accepting credit cards, you need to set up the payments processing and keep your fees low. Most merchants know about Intuit Merchant Services through using QuickBooks with online login and now they know it as a small business accounting program. They can also process credit cards. The integration makes it very easy for merchants to seamlessly charge credit cards and track their sales. In fact, we found that many merchants will accept higher processing rates with Intuit (rather than switch processors) to keep the easy, integrated accounting functionality. QuickBooks Payments online actually has lots of competitive features, but their credit card processing fees are very high. And there is another point to remember - QuickBooks payments does not have a monopoly on integration. A lot of processors can do integration. For instance, CDGcommerce, one of the best providers. Merchant account: Even when you use the pay-as-you-go option, QuickBooks Payments will set you up with a unique merchant account instead of aggregating. QuickBooks integration: Everything you do with you merchant account will automatically sync with your bookkeeping software. Intuit executes this flawlessly, for obvious reasons. Free swiper: Note, you can only get a free swiper if you don’t currently have an Intuit merchant account. Also, you can only get one free reader per account. Additional readers seem to sell for about $50 a piece. This is true for QuickBooks Payments or GoPayment with online login. Virtual terminal: This allows you to accept payment from any internet connected computer. To accept e-checks, you’ll have to apply for this separately. Mobile app: See our GoPayment review for more information about the mobile app. Invoicing: you can request payment through online invoicing directly through the QuickBooks platform by going to login page. Intuit QuickBooks Payments with login online revised their pricing structure in 2014, which benefited GoPayment customers very favorably. Now GoPayment Payments have the same exact pricing options.